Christmas will be here in a couple of months. 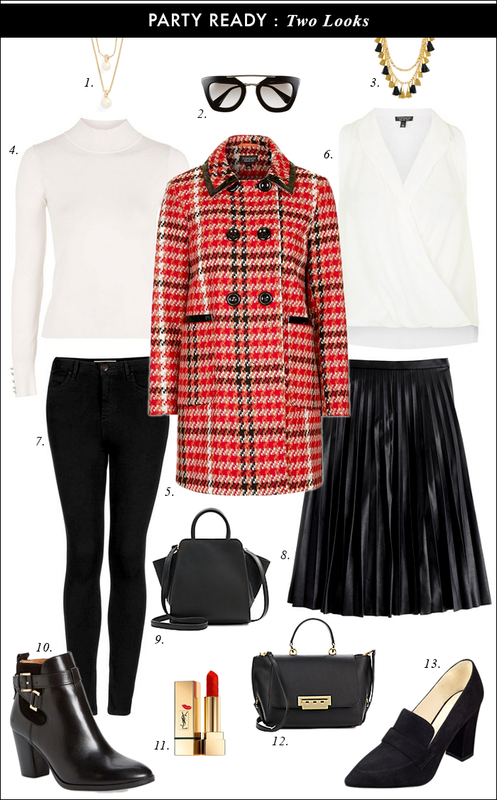 In preparation, I have put together two looks that are styled around this festive, red plaid coat, which would be perfect for any parties or events you plan to attend. Plus, I created both the looks with wardrobe basics - black jeans, midi skirt, turtleneck and blouse - that could be worn throughout the year. I love your styling! I need that pleated skirt! Love the white and black combo! Great styles! Black and white is such a classic look! I'm completely obsessed with that plaid coat! I agree that it is perfect for the holiday season, and it will be here before we know it. Love both your ideas! I think statement coats are so fun! Thanks, Darcy. I need to get a statement coat - maybe this one? Obsessed with that coat! So cute with that fun skirt! Whoa! Just when I thought your post on The Blended Blog couldn't be topped you put together this little piece. Are you kidding with that coat? Oh, my gosh! Precious!!! Would love to see you wearing it. You would style it so well. Thank you, Leslie! You might just see me wearing it. Thanks, Maria. I like wardrobe mixing. Louise et Cie 'Vianne' Booties are such an adorable pair! Beautiful outfit choice for plaid! I love that coat....I love anything plaid, really but that coat is such a pretty pattern of red plaid! Great picks! I love anything plaid, too. Thanks, Deena. I love the colors. Thank you for sharing this.